Lifeline is a Federally created program that gives a discount on basic phone service allowing it to be easier to afford for households that are low-income. 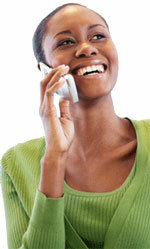 You can get Lifeline from your home telephone or mobile phone service supplier. That supplier is reimbursed by the USAC using the Universal Service Fund. Federal rules state that you can only get a Lifeline benefit on 1 wireless phone or 1 landline (wire line) telephone. Receiving more than 1 Lifeline subsidy would be a violation for Federal rules. An eligibility certification must be signed and completed by the beneficiary. For more information and details on the Lifeline Program see the USAC Internet site. Additionally, you can listen to Lifeline Public Service Announcements (PSAs) by the FCC. Lifeline is known to be a federal consumer benefit and those who make false or misleading statements willfully to get the sibsidy can be fined, imprisoned, de-enrolled or barred from Lifeline. Just 1 Lifeline subsidy (wire line or wireless) is permitted per household. Any household is NOT permitted to receive Lifeline benefits from multiple providers. For the purpose of the Lifeline support program, the definition of a "household" is a person or group of people who live at the same physical address who share expenses and income. Those violating the one lifeline per household rule, which would constitute a violation of the commission's current rules, will result de-enrollment of the violator from Lifeline, and potentially, prosecution by the United States Government. Lifeline is not a transferable benefit. The subscriber can't transfer their benefit to another person.